With only two days to go for the local government elections, campaigning has come to an end and major political parties will be bracing themselves for the peoples’ verdict. It is in an electoral outcome that will have far ranging political repercussions and one that will determine the immediate political future of the nation. Striving for supremacy in a three cornered tussle are the United National Party (UNP), the Sri Lanka Freedom Party (SLFP) and the Sri Lanka Podujana Peramuna (SLPP). Also hoping to make gains are the Janatha Vimukthi Peramuna (JVP) and the Tamil National Alliance (TNA), the latter being assured of victory mostly in the North and East of the country. President Maithripala Sirisena has been spearheading the campaign for the SLFP. Despite his many onerous duties as Head of State, President Sirisena has taken time off his schedule to address as many campaign rallies as possible. In doing so, his theme has been that he is fighting against corruption in government from all quarters. As evidence, he has pointed to the findings of the Presidential Commission of Inquiry into the Central Bank bond sale and to the reports of the Presidential Commission inquiring into corruption and abuse of power. It must be noted that the former finds fault with appointees of this government while the latter relates mostly to activities of the previous government headed by former President Mahinda Rajapaksa. President Sirisena has been stressing that his is a fight against corruption in government regardless of the political persuasions of the alleged offenders. There was some activity in this regard over the weekend with the arrest and detention of Arjuna Aloysius and Kasun Palisena, both of Perpetual Treasuries Limited, the company at the centre of the Central Bank bond sale investigation. Aloysius is the son-in-law of former Central Bank Governor Arjuna Mahendran, a Singaporean national who is currently believed to be in his home country. The news of the arrest of Aloysius and Palisena filtered in as the President and the Cabinet gathered for Independence Day celebrations at Galle Face last Sunday. They have now been produced before courts and remanded. It is likely that charges will be laid against them by Police who are conducting further investigations. That President Sirisena chose to engage in a strenuous campaign for what is essentially an election to local government bodies is because he feels this is an opportunity to reform and gain full control of the SLFP. As it is now, the party is deeply divided with the rank and file split in their loyalties between President Sirisena and his predecessor, former President Rajapaksa. Even the parliamentary group elected under the banner of the United Peoples’ Freedom Alliance (UPFA) at the August 2015 general election is split into two groups: at last count, 51 parliamentarians remained loyal to Rajapaksa while 45 continue to extend their support to President Sirisena. The President’s thinking is that if the SLPP can be defeated comprehensively at the poll, it would sound the death knell for the party which is anyway a fledgling political organisation. To be fair by President Sirisena, if he been critical of his coalition partner- the UNP- while on the campaign trail, his criticism of the Rajapaksa regime and the SLPP has been even more strident. From a UNP perspective, it will have only itself to blame if it does not emerge victorious at the election. If that was to eventuate, it would undoubtedly be because of the damage caused by the Central Bank bond sale issue unravelling at the time of the poll. The party went in to damage control mode last week, releasing a statement regarding the recommendations of the committee headed by Foreign Minister Tilak Marapana which studied the findings of the Presidential Commission of Inquiry into the Central Bank bond issue. The Marapana committee recommended that Ravi Karunanayake step down as Assistant Leader of the party until investigations into the issue are concluded. To date, Karunanayake has not heeded the party’s call and has protested his innocence. Even if he did step down now, many believe that would only limit the damage to the prospects of the UNP. Unfortunately, Karunanayake’s stubborn resistance will not help the UNP on Saturday. Officially, the party’s stance has been that it agrees with the concept that wrongdoers should be punished, noting that Karunanayake has not yet been found guilty. In the election campaign, it has also been expanding on the various concessions it granted to the electorate soon after assuming office. Restoration of democracy- as opposed to the repressive tendencies of the previous government- has also been cited by the UNP as being among their achievements. The party for which this poll is truly a ‘make or break’ election is the SLPP. It is no secret that the SLPP was formed with the sole intention of carrying forward the Rajapaksa legacy. 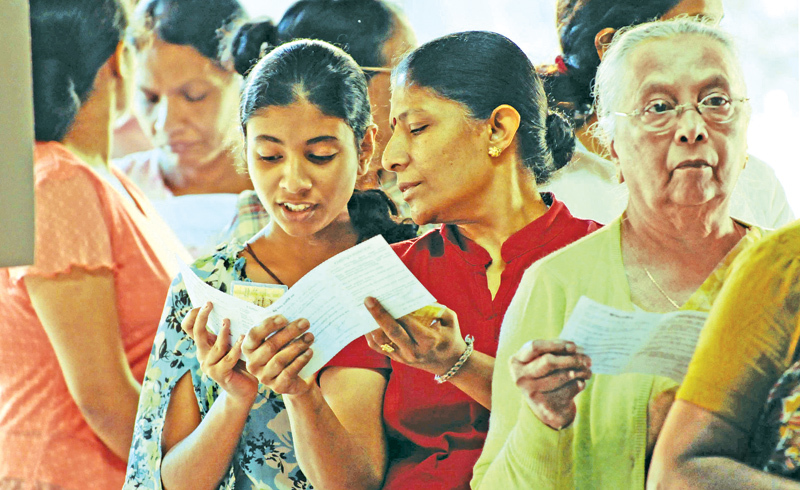 Without the Rajapaksas as their icon, the party would not command much of a following. It must be noted that even while the SLPP campaigns vigorously on slogans that lambast President Sirisena much more than they attack the UNP, key figures in the SLPP including former President Rajapaksa himself, remain members of the SLFP! That is because the objective of the Rajapaksa faction of the SLFP is to eventually wrest control of the SLFP leadership- rather than to progress the SLPP to become a fully-fledged political party. This is why the local government polls are absolutely critical for the SLPP. If the party does not make much headway at the election, the campaign to re-establish the Rajapaksas as leaders of the SLFP will be stillborn. Furthermore, it will be difficult to then prevent parliamentarians currently in the Rajapaksa camp from gravitating towards President Sirisena. In the event the SLPP is successful in making some electoral gains, it still has to contend with President Sirisena whose position as leader of the SLFP is unassailable until he relinquishes office. The earliest this can occur is in January 2020. Therefore, a defeat for the SLPP will lead to its disintegration. However, even if it secures a significant number of Local Government institutions, it still has more work to do to gain parity with the UNP and the SLFP at the next national elections. What has escaped attention in assessing the relative merits of political parties at this election is the new electoral system that will be put to the test. This is a combination of the proportional representation (PR) system and the Westminster style ‘first past the post’ system. This is being implemented for the first time in the country and will be watched with great interest. Whereas the first past the post system resulted in landslide majorities for one political party, the PR system often meant that no party got even a simple majority, resulting in parties having to coalitions to stay in office. The new system will add a different dimension, enabling the most popular party to get a working majority without much difficulty. For instance, if indeed the SLFP vote base splits down the middle between the mainstream SLFP and the SLPP, that would enable the UNP to secure victory in individual wards, giving it an advantage in the final tally of seats in each local council. While that is the thinking in UNP circles, this would however depend on the extent to which the SLFP vote base is divided and to what extent the UNP is able to retain its core vote. Due to the multitude of factors affecting voter sentiment- and the new electoral system in operation for the first time- it would be foolhardy to make predictions regarding the outcome of Saturday’s elections. There is however likely to be wide regional variations in the result- with the possibility that more than one party will claim overall victory on Sunday morning after all the votes are counted.